See San Francisco from the other side of the bay. Photo by Aubrie Pick. Don't let all the San Francisco hype overshadow its lovely Bay Area neighbor. Between the spectacular coastal views, small-town charm, and plentitude of outdoor activities, Sausalito has something for everyone. SAUSALITO, California – When I worked in Manhattan, I lived in Brooklyn. I preferred to look at the skyline all kind and twinkly each night as I retreated back home on the D train; being outside the city gave me perspective. 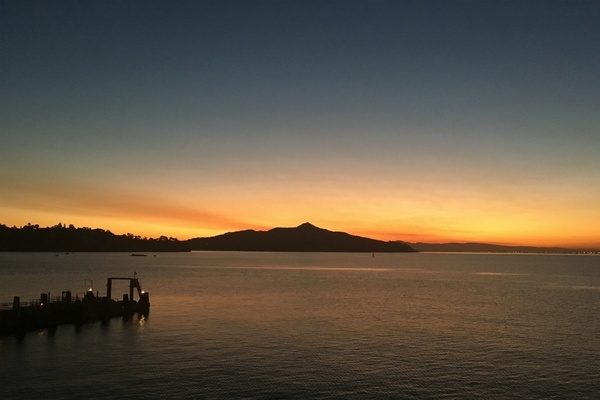 So when I arrived in Sausalito — the sleepy California town just a ferry ride across the bay from San Francisco — it immediately suited me. Us outsiders have the best view. 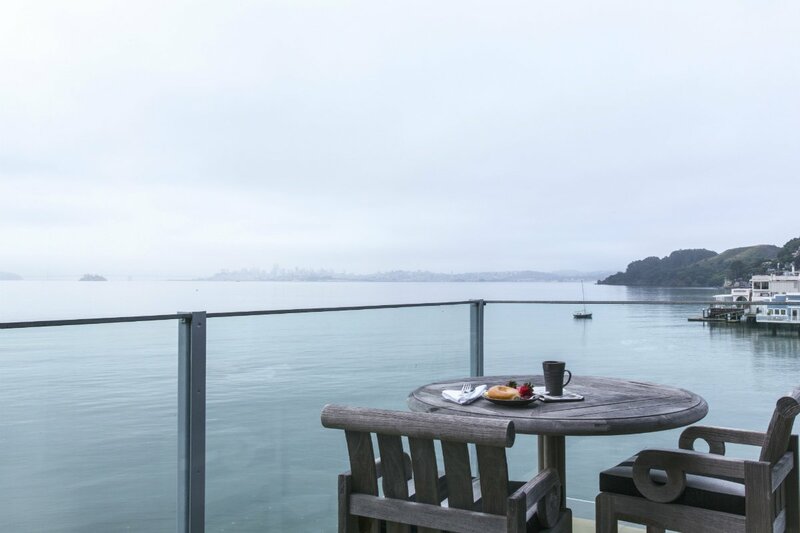 Sausalito sits on the edge of Richardson Bay with views of historic Angel Island State Park, the town of Tiburon, the iridescent Bay Bridge, and, of course, San Francisco. According to the Sausalito Historical Society, the town has always been a home to travelers: first a train and ferry crossing until the Golden Gate Bridge was completed in 1937, then a wartime shipyard, and a port for passenger ferries since 1970.
is a guesthouse perched right on the water and practically on top of the ferry port (we'll come back to that), originally built in the '60s as luxury apartments. At that time, Sausalito was the Brooklyn of the Bay Area, attracting artists and hippies with cheap rents and nice views. The father of current owner Kass Green built the apartments himself and lived there until converting the building into its current incarnation 22 years ago. 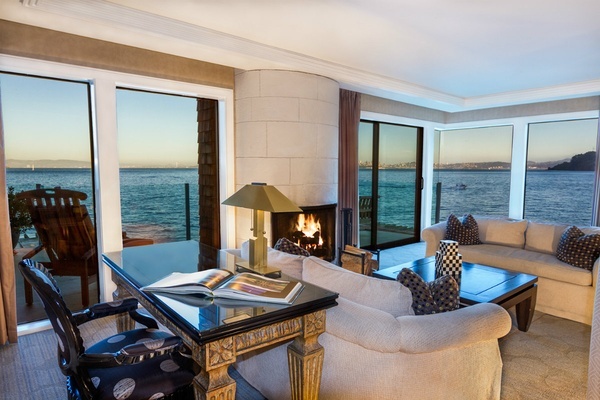 A cozy fireplace and a killer view. Photo courtesy of the Inn Above Tide. Bathtime scenery at its finest. Photo by Aubrie Pick. A sunrise worth the early wakeup call. Photo by Kelsey Burrow. The inn's residential genesis permeates its rooms in the best way. No room is like another, each with its own nooks and viewpoint, and each feeling uniquely homey. 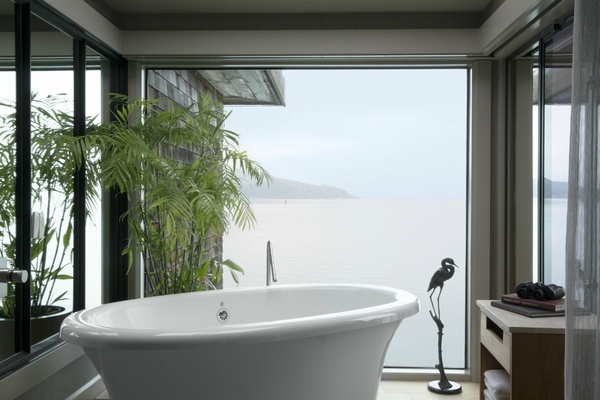 Thankfully, many aspects feel a world away from home: waterfront views from every room, a luxurious bathtub and fireplace, and small-town stillness just minutes from the buzz of San Francisco. Then there's the sunrise. If you're staying at The Inn Above Tide, you get out of bed for sunrise. Period. Sausalito native and owner Kass is a trained cartographer, which is evident in the materials found in each room: an adventure map and a walking tour, to name a few. Hit the trails around the iconic bridge. Photo by Kelsey Burrow. Once awake for that sunrise, might as well make the most of the extra hours. Lace up running shoes and head for the Golden Gate Bridge. Take a left on Bridgeway from the inn and follow the water until East splits from Alexander. Follow East and stop often for spectacular views and selfies. There's the Bay Area Discovery Museum, but keep going to the base of the bridge at Horseshoe Bay. And the motivation for the two uphill miles back? Coffee and scones at . This sweet, airy cafe is a popular bicyclist stop for its house-roasted coffees (even a bright Ethiopian pour-over for snobs), seasonal pastries, and avo toast. Next up is a kayak or paddleboard tour with , Sausalito's water adventure experts. Head up the shoreline away from SF for a different view — of harbor seals, sailboats, and "floating homes" (locals aren't a fan of the term "houseboats"). Fun fact: Author Shel Silverstein lived on a redwood houseboat he deemed Evil Eye from 1967 to 1981. The perfect coastal meal at FISH. Photo by Kelsey Burrow. After a long run and a few hours on the water there's , a casual marina-front restaurant completely dedicated to sustainable seafood. 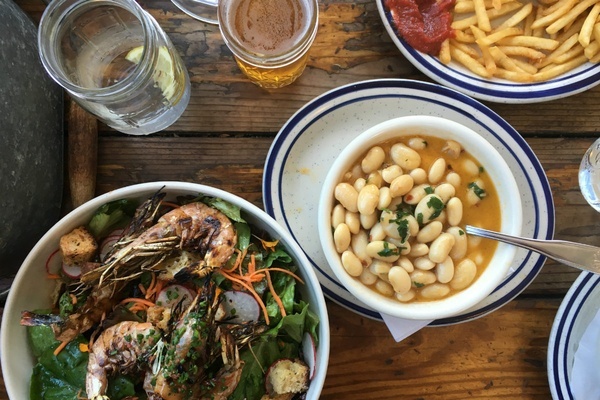 It has everything a waterfront joint should have: picnic tables, hands-on eating, good service, and great beer. From FISH, walk to for a factory tour (the mid-century building is a design spectacle in itself) and shop the seconds. Tours of the original factory built circa-1947, where the iconic California ceramics are still made, are offered Friday through Sunday (see site for times). Walk through the Clay Room, see the molds for the beloved bud vases, compare glaze swatches, and sweat by the kilns before being cut loose in the promised land, aka the Overstock Room, where discounted seconds, prototypes, discontinued products, and samples await. From Heath, take the long way home and roam Sausalito by foot. Climb to the top of the hill, take in the view, then find Excelsior Lane for a secret cut-through back to The Inn. Every evening, The Inn Above Tide hosts a wine and cheese reception for guests. Take a glass of pinot to the deck for a little quiet time while watching the sun set. Then snap out of that trance and go drink one (or seven) of chef Joanne Weir's famous margaritas at . Don't miss the tequila, ceviches, or the Gorditas de Huitlacoche (if available). The Michelin-starred about a half mile away should be on the itinerary as well. Close the perfect day with some live jazz and lovable dive vibes at Sausalito mainstay No Name Bar (757 Bridgeway). Molina in Mill Valley. Photo courtesy of Molina. These two forays into Marin County won't fit into a Sausalito day, but are worth the trip. Rent a bike or take a bike tour with around Marin County and ask to end at neighboring town Mill Valley for an afternoon of shopping and supper at . 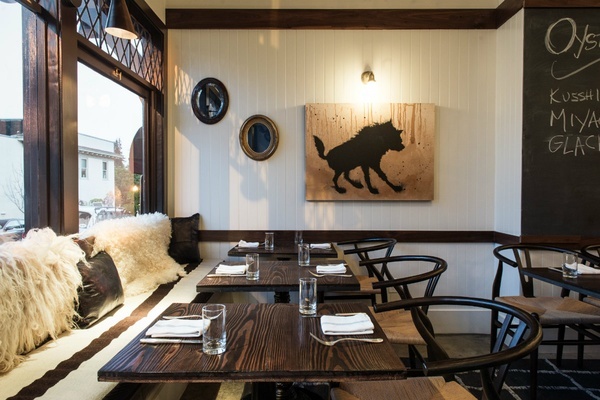 The off-the-wall wine list won't disappoint (try something from local Idlewild Wines), and chef Kyle Swain can be found manning the restaurant's wood-fired oven where he cooks his full menu of coastal California dishes like smoked olives, pork ribs, and feta-stuffed Hatch chiles. Hike the hills in the "crown jewel" of the Golden Gate National Parks, the . There are panoramic views of the bay as well as campgrounds, dog-friendly Rodeo Beach, and the still-in-use Point Bonita Lighthouse. Between The Inn Above Tide's complimentary bikes and the Golden Gate Ferry to San Francisco outside the Inn's door, there's no need for a car. 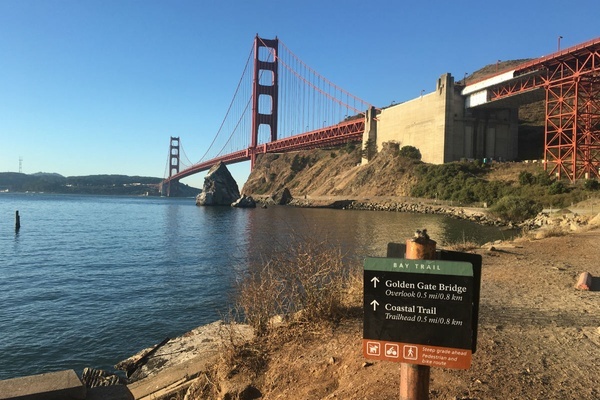 Wander on foot using Kass's Sausalito Step Walk map. Kass's of Marin County must-sees is available to anyone on the inn's website. From San Francisco, take the Golden Gate Bridge and exit onto Alexander Avenue. Continue onto Bridgeway into the heart of Sausalito. From out of town, fly into SFO (San Francisco International); a cab ride will take approximately an hour, depending on traffic.